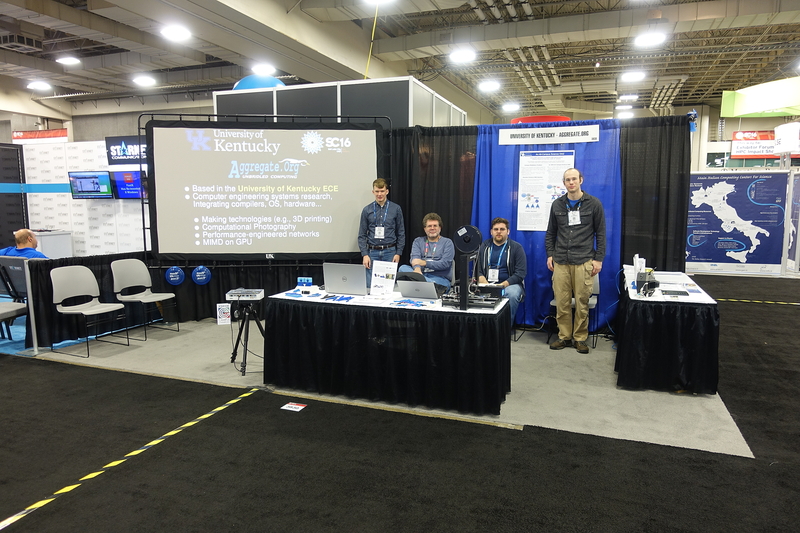 This is the home page for our 23rd major research exhibit at the IEEE/ACM Supercomputing conference. The exhibit is now under the slightly changed title University of Kentucky / Aggregate.Org, but it is still really run by our informal research consortium led by our KAOS (Compilers, Hardware Architectures, and Operating Systems) group here at the University of Kentucky's Department of Electrical and Computer Engineering -- hopefully, for the last time. The Center for Computational Sciences is displaying various things in the exhibit this year, and is expected to take the lead for future exhibits. We are booth #3830, a 10x20 booth; the exhibit hall essentially has two wings, and we are located about 1/3 of the way up in the right wing (Hall 2 in this map). TIK: Temporal Imaging from Kentucky -- for years we've been working on Time Domain Continuous Imaging (TDCI), which replaces the concept of am imager capturing frames with capture of continuous waveforms for pixel light level over time. With TIK, you can do this using conventional still and video cameras! A Maze of Twisty Little Passages -- an update to MOG (MIMD on GPU). The MOG core is becoming close to production quality and there are now several system calls implemented (the GPU code can now perform host system calls). We didn't bring the big wooden maze, but did bring a couple of small plastic ones that made the MIMD-can-run-efficiently-on-SIMD point as well as their giant wooden sibling used to. Are website updates ever done?